I have a system for cutting down my tall grasses that I've mastered over the years. 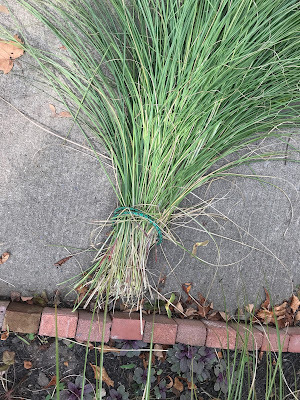 It's really a bit early to be cutting down the grasses, and I normally wouldn't until later in the fall, but these particular grassses are large and tall clumps in my hellstrip the area between sidewalk and road. When I'm backing the car out of the driveway, I can't see around them. They're usually okay until about the end of July – I can see over and through them, but currently, they're a hazard. 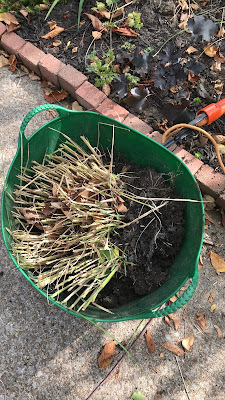 After seeing my wife, in past years, cutting the grasses by hand with not-so-sharp secetors, taking lots of time and effort, having sore hands afterwards, and ending up with a mess to take to the compost or trash, it seemed like one of the tasks we both least looked forward to in the fall. 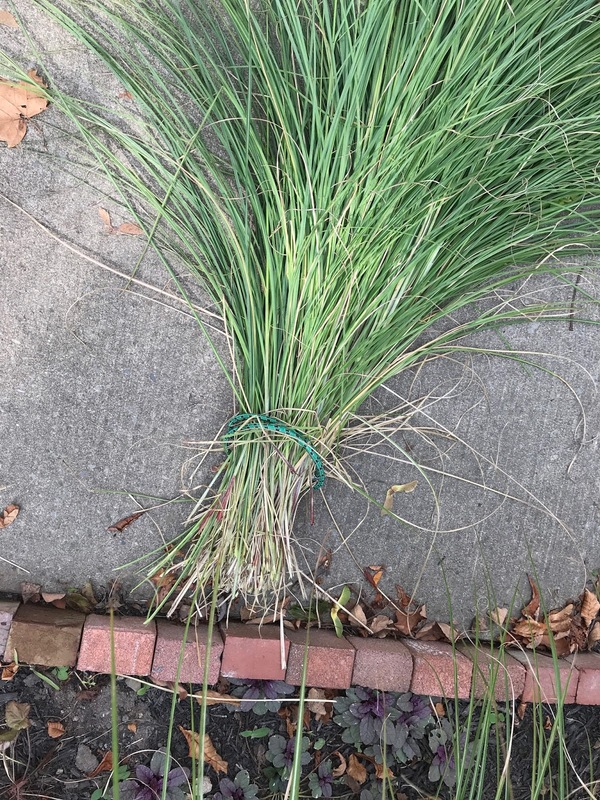 I don't remember where I picked this up, but I now wrap the grass with a bungee cord about a foot or two from the ground, cut through it with the hedge trimmer, and end up with a neat bundle, easy to carry off to the trash or compost. 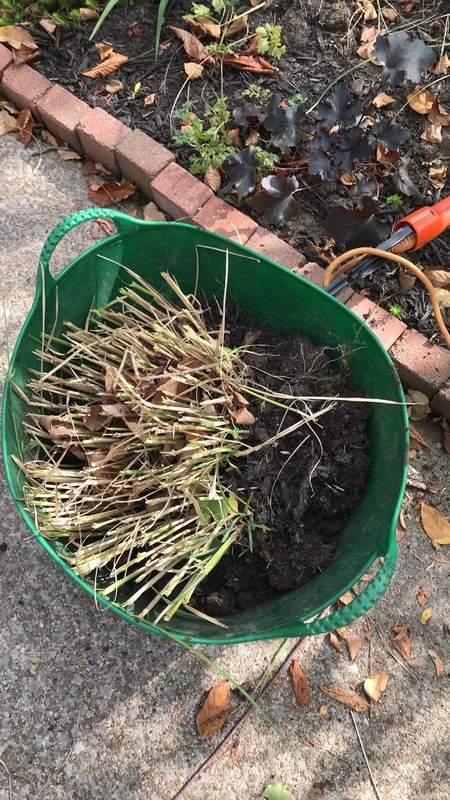 It's made a slow slog of a job into a ten-minute autumn clean-up. The rest of the grasses we'll leave up through Halloween, and trim them this way before the snow flies. 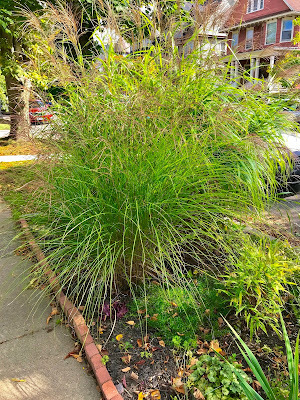 I know many that like to leave their grasses up through the winter because they can look good (dead and dried) when there's not much else to look at in the garden. 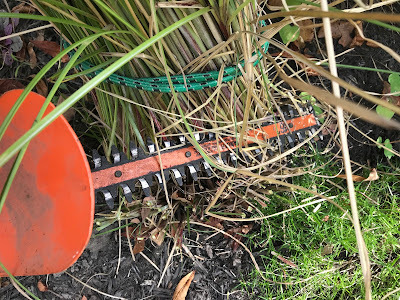 And then, in the spring, what remains is easier to clean up by just picking up and pulling, but there's enough other tasks to do in the spring, and we have the time now. 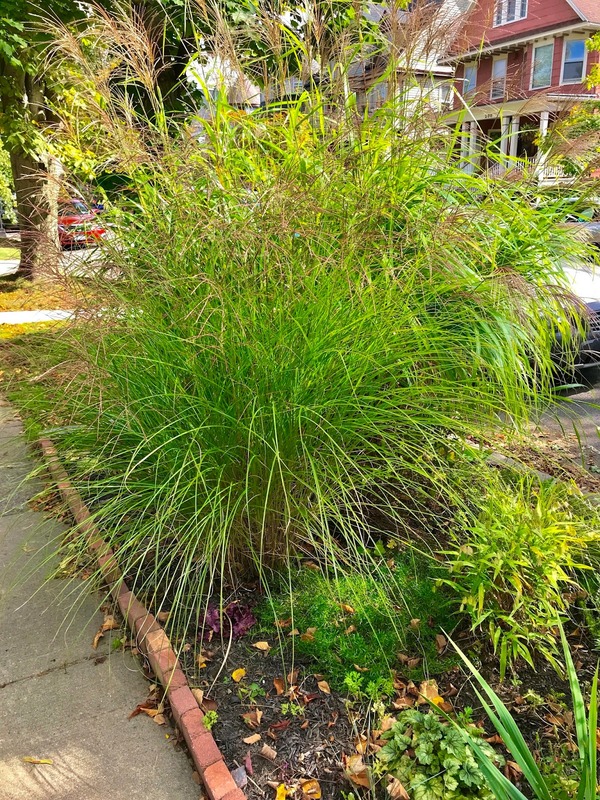 Not sure what type of grass it is, but they're about six foot tall and scratchy. And hard to see around when backing out the driveway. 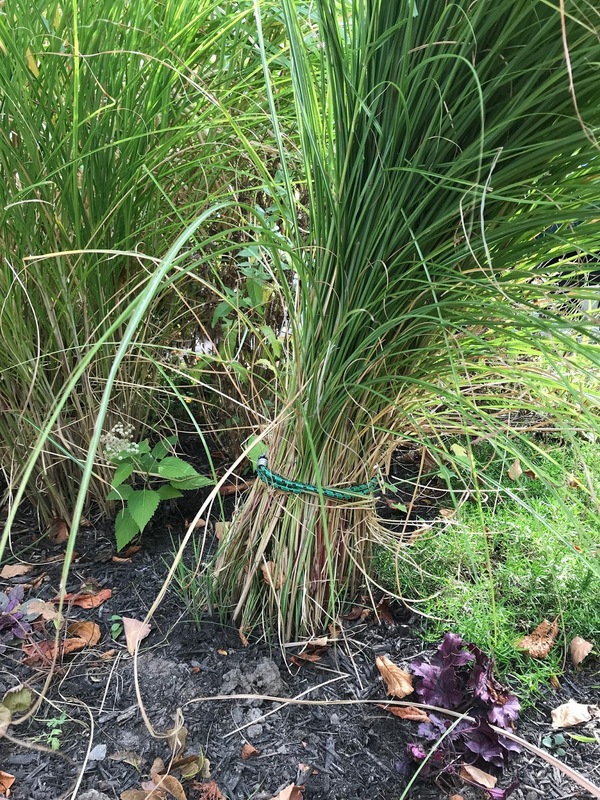 I wrap a bungee cord around the base, a foot or two up. Learn from my mistakes – wear a long sleeve t-shirt. I love maintenance that requires a power tool. And what remains will grow to the same height next year. 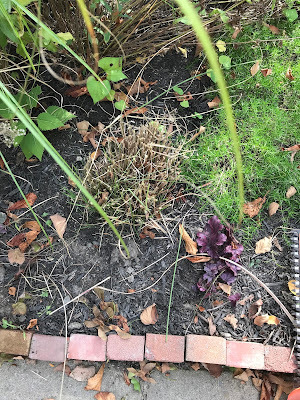 Except I have too many of these grasses in my hellstrip and I removed them, They're taking up too much room, and there's lot of other perennials that want st space and could use more sunlight. I've posted them on Facebook for anyone to come and take. There's four! 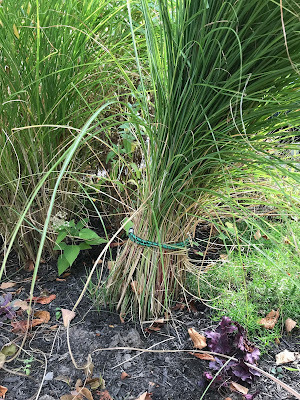 I usually use twine but I can see that a bungee cord would work just fine. Well done.